A simple marinade, frequent basting, good food! This dish was the result of a nothing-too-fancy day for me. I kept the wok aside, yawned at the thought of cooking rice and two accompanying dishes. I felt so uninspired that I grabbed two bottled sauces off the shelf and decided that it was all I was going to have for a chicken marinade. Teriyaki and plum sauce? You can never go wrong. How did it taste? Finger-licking flavourful sweet! 1) Marinate chicken with teriyaki sauce, plum sauce and dried rosemary. 2) Line baking tray with foil before laying drumsticks on top. Leave aside. 1) In a bowl, mix potatoes, butter, rosemary and salt together. 2) Place potatoes into ramekins. Cover with foil. 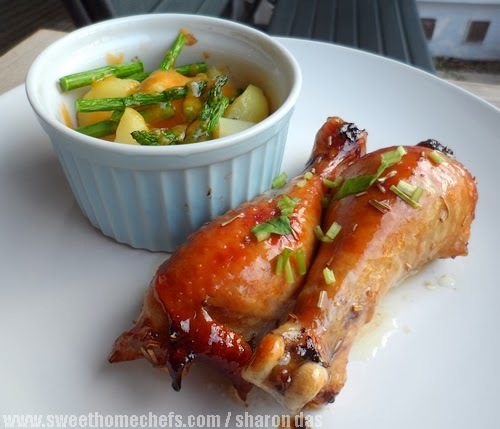 1) Place baking tray with marinated drumsticks and ramekins with potatoes into oven. 2) Bake in preheated oven at 180C for about 40 minutes (until everything is cooked). Baste drumsticks with marinade on the 15th minute. Baste every 7 minutes after. Remove foil from ramekins 10 minutes before end of baking time. Add asparagus. Continue baking until asparagus is cooked (about 8 minutes). Then, sprinkle shredded cheddar on top. Bake for a minute and you're done. 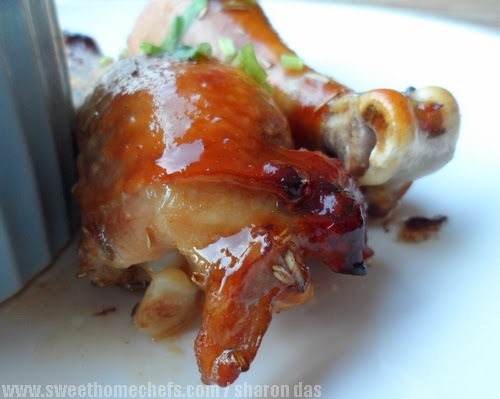 From left (top): Marinate drumsticks. Buttering the potatoes. Place potatoes into ramekins. From left (bottom): Put everything into the oven. 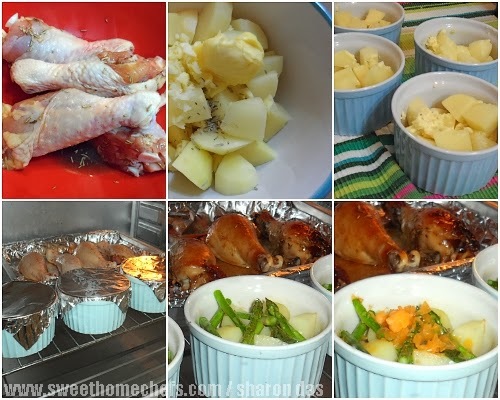 Baste drumsticks and remove foil from ramekins to add asparagus. Finally, top with shredded cheddar. Wait a minute... this recipe sounds like a lot of work. I could have sworn I started out determined to do things as 'easy' as possible. Oh Sharon, I am loving the look and the flavor of this chicken...and is seems so easy...thanks for the recipe. I agree. I wondered why I made so little..lol! Gosh, I love how the chicken turned out! Love the shine! I love your chicken recipes! All of them! This one looks fabulous. Teriyaki and plum sauce...what can go wrong? Happy cooking in 2014!! Everyone always needs a meal like this in their back pocket.Easy and delicious. Hope your New Year is starting strong, Sharon!